Thank you Jerold S. Bell for your permission to reprint this article. Where are we, and where do we go from here? Most owners have now received their rcd-4 PRA test results from the Animal Health Trust that were collected at the GSCA National Specialty in Ohio in June 2011. The AHT reports that of the 107 cheek swabs submitted from the collection; 3% test as affected (two copies of the defective gene), 30% test as carrier (one defective and one normal copy), and 67% test as clear (two normal copies of the gene). The AHT previously reported a 50% carrier rate worldwide for the defective gene in Gordon Setters. However, this included all of the initial families of affected dogs that were used in the research to find the defective gene. The 30% carrier frequency from the dogs collected at the 2011 National probably represents a more accurate breed-wise US carrier frequency. The rcd-4 gene that causes Gordon Setter PRA is one that similarly causes autosomal recessive late-onset progressive retinal atrophy in man. Owners of dogs who received affected test results are probably surprised with the result, and find no vision problems with their dogs. This is because this is a late-onset disorder. It was originally reported that the average onset of this form of PRA was around 10 years of age. This is the average age of Gordon Setters recognized with visual impairment that test affected with rcd-4 PRA. The actual age of onset of Gordon Setter rcd-4 PRA is possibly much older; with may affected dogs never reaching the age of onset of visual impairment. In addition, owners of very old Gordon Setters with visual impairment may believe that it is “normal” for old dogs to not see well, and do not pursue a diagnosis of PRA. The fact of the matter is that there is a range of age of onset for the clinical signs of Gordon Setter rcd-4 PRA where some may slowly lose their vision at younger than 10 years of age, and some may never show clinical signs of a vision problem. Rcd-4 PRA is not the only inherited PRA in the breed. It has been shown that there is an earlier-onset PRA in the breed, with an average onset of 5 years of age. Some Gordon Setters clinically affected with this form of PRA and their parents have tested clear of the defective rcd-4 gene, proving that there are two separate genetic PRA disorders in the breed. Dr. Cathryn Mellersh at the AHT (cathryn.mellersh@aht.org.uk) is currently searching for the defective gene causing this form of PRA in the breed, and is interested in cheek swab samples from affected dogs and their close relatives. Because there is more than one form of PRA in the breed, and because Gordon Setters can also have other disorders of the eyelids, cornea, lens, and retina, the rcd-4 genetic test does not replace the need for annual CERF examinations of the eyes. (since original publication of this article CERF is no longer operating see OFA website instead.) The most important thing that we need to do about rcd-4 PRA is to not devastate the Gordon Setter gene pool with widespread spaying/neutering, and the removing of quality dogs from breeding. Aside from the loss of quality dogs, the breed cannot withstand the removal of 30% of breeding dogs from the gene pool and maintain breed genetic diversity. This is the first direct gene test that is available for the breed, but it will not be the last. We must all recognize that the proper use of genetic tests for recessive disease is to breed quality carrier dogs to quality clear dogs, and replace the carrier parent with a clear-testing offspring that is of equal or better quality. If a quality dog that you determine deserves to be bred tests as a carrier, you certainly can and should breed the dog. You must make a decision counter to the emotional reaction when you received the carrier test result. Making a decision to not breed a quality dog based on a single testable gene is not appropriate. As long as carriers are not bred to carriers, no affected dogs will be produced. This is a testable and controllable gene. By dealing with rcd-4 PRA in an objective and informed manner, we can continue to produce quality Gordon Setters and work away from this single hereditary disorder. The goal is to slowly decrease the carrier frequency in the population and slowly replace carrier breeding stock with normal offspring. This will take many generations. A genetic test should not alter who gets bred, only who the dog gets bred to. For more information, please refer to the articles in the February TarTan Tidings (or the March, 2011 GSCA Newsletter). Lastly, it is important to remember that this is about the dogs. We belong to a community that loves Gordon Setters. No one wants to produce carrier or affected dogs. The stigmatizing of breeders and quality dogs due to carrier status is an old, outdated and unacceptable practice. We need to be able to raise the level of conversation to constructive communication. We should all report rcd-4 test results on our dogs to the OFA open health databases. This includes clear, carrier, and affected dogs. An application form is available in the DNA tests section of the OFA website. The application should be mailed with a copy of the official test results from the Animal Health Trust. The fee for entering rcd-4 results into the OFA database is $15 for clear and carrier dogs, and is free for dogs testing affected. As more genetic tests become available, we will find that there are no “perfect” dogs. 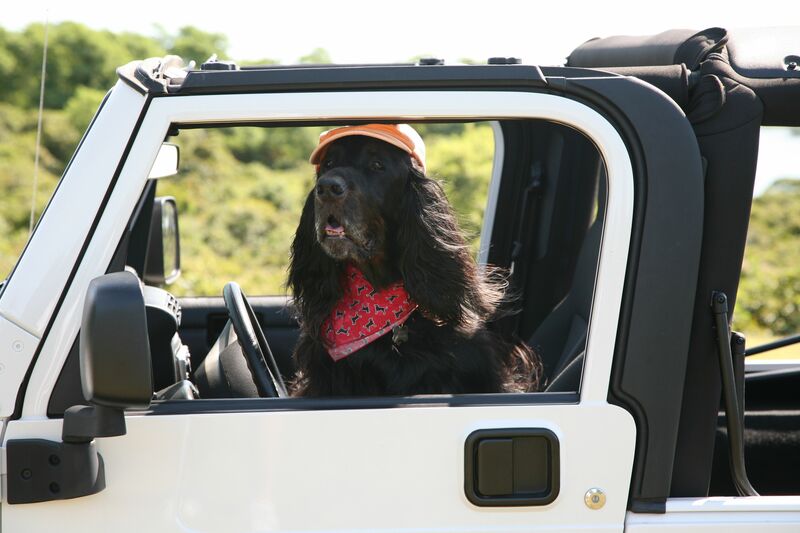 By working together we can improve our breeding attitudes, our breeding programs, and the overall health of the Gordon Setter breed. To order rcd-4 PRA test kits from OFA click this text. About CERF: After nearly 30 years of working towards the elimination of heritable eye disease in dogs, The Canine Eye Registration Foundation (CERF) is now closed. Previous PostRethinking Puppy SocializationNext PostCHIC for DUMMIES – What is it – why should I use it? Laurie Ward: Thanks, Cindy McGovern. Special thanks to Sally Gift for her research!